Update: I forgot to make the IFS variable local to the function. This would break things like git-bash-prompt, if the IFS is suddenly set to something else. This takes around two minutes on a modern machine. This is slow. Very, very slow. This will run in a few hundred milliseconds. You get roughly three orders of magnitude speedup. Since then a lot has happened. Emacs 24 has been released, package managers like MELPA or ELPA have become standard, and company-mode seems to be winning against auto-complete. Also, clang has made huge strides forward. So it is time to revisit the task of developing C or C++ using Emacs. I have put online an easy-to-install Emacs init.el that you can use as a start for your own development environment. 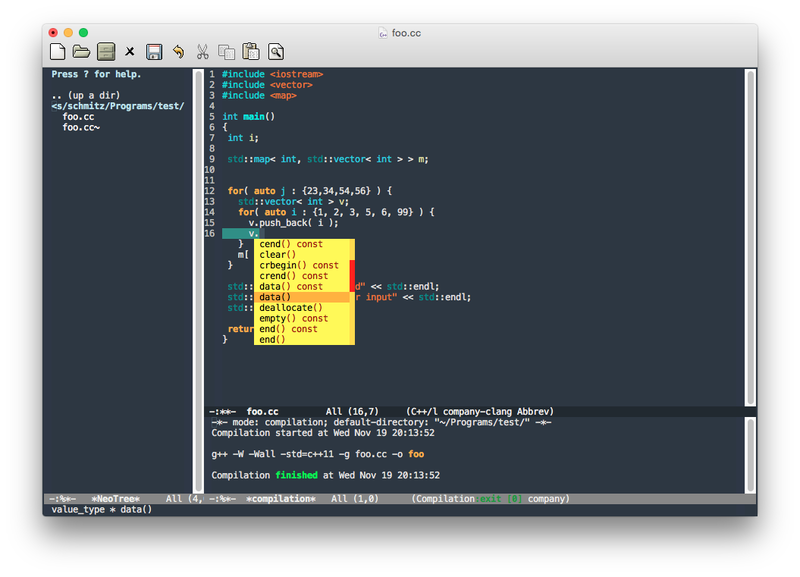 I am using the OS X version of Emacs, but this should also work on Linux, given that you have clang and git installed. The file will make sure that upon startup of Emacs all necessary packages are installed, like company, magit but also LaTeX tools like aucTeX or refTeX. You can disable this check (or individual packages) in the init.el. The code is up on github, so feel free to fork and/or contribute. f3 – Runs ff-find-other-file, trying to switch between header and implementation for C/C++ programs. f4 – Toggles the last two used buffers. f5, f6 – If tabbar is enabled (tabbar-mode), navigates back/forward through tabs. f7 – Toggle ispell dictionaries (german/english). f8 – Kill current buffer. M-n – Go to next error in compilation buffer. M-S-n – Go to previous error in compilation buffer. M->, M-< – Go to next/previous Emacs frame. 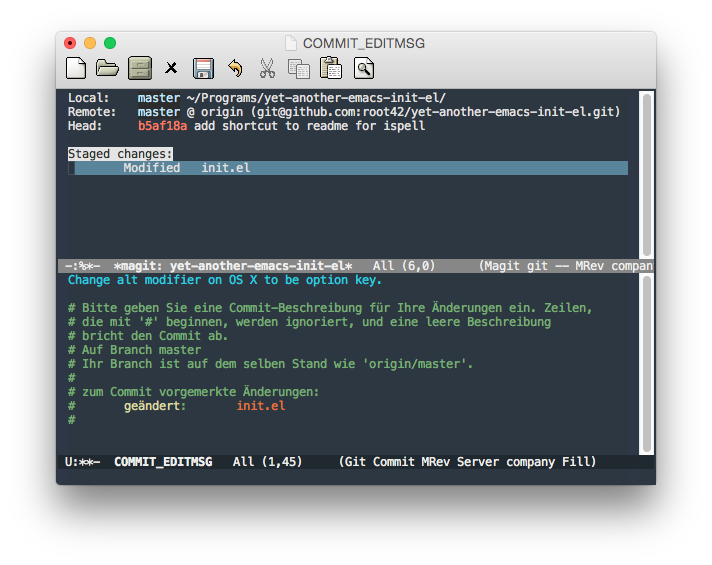 M-/ – Run autocompletion using company mode. You can run it by executing M-x magit-status. Just type ? to get online help. Magit uses simple one-character-commands, like s for stage, c for commit, p for push and so on. Currently I am evaluating the integration of lldb into Emacs, but haven’t come far enough to say that I have found a powerful and flexible interface, apart from the standard command line. So there’s more to come, hopefully! Additionally, you can now run the refresh command manually, by hitting C-c C-r.
Update: I changed the after-save-hook to only trigger if we are in a buffer that has cider-mode enabled. Otherwise every save command in Emacs would have triggered the refresh! It seems that the ssh connection goes bad for some reason. After this you won’t be able to save the file anymore. You can work around this by running M-x tramp-cleanup-all-connections and then saving again.